In remembrance and celebration of the founding of the African Methodist Episcopal Church, the Edisto District, under the direction of the Reverend Dr. Norvel Goff, Sr., Presiding Elder, will present a weekend of events in recognition of its founder – Bishop Richard Allen, and the “birth” of African Methodism in this nation and world. The 2018 Founder’s Day begins on Saturday, February 10, 2018 with a “Walk” that will consist of the 31 congregations of the Edisto District, pastors, along with representatives from the churches Young People’s Division (YPD) and the Sons of Allen. The “Walk” will begin at Liberty Square (the site for the International African American Museum) and conclude at Mother Emanuel AME Church. The “Walk” will be symbolic of the response provided by Bishop Richard Allen, as he led other Black worshippers in 1787 out of the White St. George’s Methodist Episcopal Church in protest to the discriminatory practices and racial segregation of that congregation and its leadership. The 2018 Founder’s Day Walk will begin at 9:30 AM and conclude by 10:30 AM, in preparation for the 2018 Founder’s Day Symposium. The 2018 Founder’s Day Symposium – “The History and Legacy of African Methodism In America: Impacting Racism and Racial Reconciliation Since 1818” will begin at 11:00 AM on Saturday, February 10. The event will feature a skit by the Young People’s Division, which will be an enactment of the events at the White St. George Methodist Episcopal Church that resulted in Bishop Richard Allen and the Black congregants walking out of the St. George Church after being pulled, dragged, etc. from the altar as they knelt in pray. The day will continue with a panel discussion that will include the following community leaders: Senator Marlon Kimpson; Dr. Bernard Powers; Ms. Carolyn Hunter; Reverend William Miller; Mr. Willi Glee; and a youth. Ms. Carolyn Murray of WCBD-TV2 will serve as the moderator for the day. On Sunday, February 11, 2018, the Edisto District will convene for its 2018 Founder’s Day worship service at 4:00 PM. The proclaimer for the worship service will be the Rt. Reverend Samuel L. Green, Sr., 125th elected and consecrated Presiding Prelate of The Seventh Episcopal District. 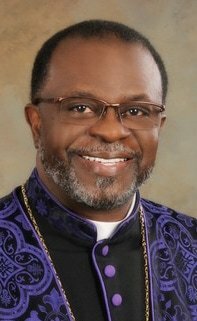 Prior to being assigned to the Seventh Episcopal District, Bishop Green served as the Presiding Bishop of the 15th Episcopal District (encompassing Angola, Namibia and the western part of South African, inclusive of the city of Cape Town), and the 12th Episcopal District (encompassing the states of Oklahoma and Arkansas). The Edisto District Founder’s Day Mass Choir, under the direction of the Reverend Randolph Miller, will provide the music for the worship service. Bishop Richard Allen, the founder of the African Methodist Episcopal Church, was a man of sublime courage, indestructible and passionate faith. Equipped with these two spiritual weapons he could not be beaten down. When he and others of African descent were denied the freedom to worship God in the St. George Methodist Episcopal Church in Philadelphia, Penn., he politely walked out into God’s great big world and started the movement which blossomed into the African Methodist Episcopal Church. For more information regarding the Edisto District 2018 Founder’s Day, contact Mrs. Liz Alston, Committee Chair, at (843) 723-0941 or the Mother Emanuel AME Church at (843) 722-2561. The Reverend Dr. Norvel Goff, Sr. serves as the Presiding Elder for the Edisto District of the South Carolina Annual Conference – African Methodist Episcopal Church.